The end of a trip always seems to be dominated by the mundane; packing, dumping stuff you no longer need and finding out how long it will take to get to the airport. Every time we face up to the prospect of coming home I convince myself that we can sail through those tasks with a minimum of fuss and have plenty of time to extend the holiday by one more bit of sightseeing, one more meal in a funky little cafe. And every time, I am wrong. The one thing we had to do before giving the RV back was empty its holding tanks (See? The mundane...). But the reason that the campsite we were staying in was the last to fill was that it had no running water and no place to dump holding tanks. 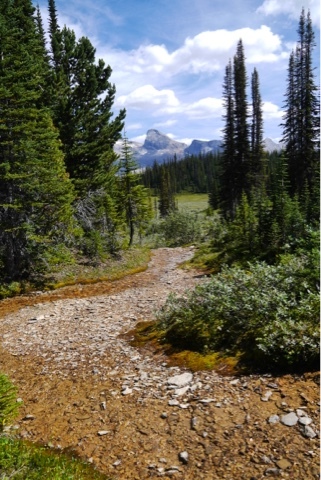 In fact Yoho campgrounds were a bit infuriating in this respect because I even those that had water insisted it had to be boiled before consumption, which is a pain when you are thirsty... We noticed our tenting neighbours had brought a huge bottles of the kind used in water coolers. OK so there would be plenty of faffing to come, but first breakfast. Leftover potatoes, the last of the mushrooms, a final strip of bacon all fried up with a tin of emergency baked beans we'd never needed. Breakfast of champions. We washed up, cleaned out, packed up and set off on an increasingly frustrating search for a dump station and a place to hose down the RV. The Kicking Horse dump station, where we had never seen a single vehicle, now had a queue of five. The Lake Louise overflow lot had nothing. Neither did the Castle Rock campground. Finally back at Johnston Creek we found what we needed. I emptied everything and hosed down the RV, but failed to make any impression on the mud and dust that had been baked on over two weeks. 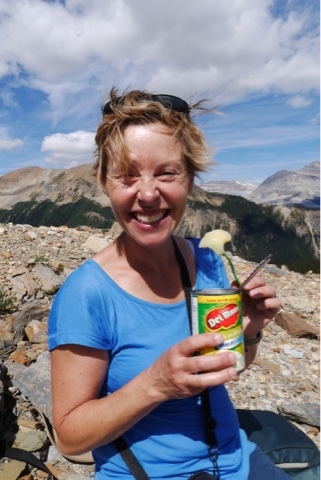 Well all this meant that our hopes for lunch somewhere had evaporated and we had to settle for a quick coffee and the last of our yoghurts in a Day's Inn access road when we stopped for fuel in Canmore. Oh the glamour. We pressed on, joining a rush of fast moving motorway traffic heading east. The mountains soon vanished behind us and we were in flat farmland, heading for Calgary to give back the RV. It was just about over. From Vancouver to LA to the Rockies this has been a splendid holiday indeed with so much variety it feels as if we have been away for months. We re-enter the real world a little browner, a little fitter and a possibly a little fatter, but with some terrific memories; hearty Japanese greetings, the flyover experience and a stunning afternoon bike ride in Vancouver. Gleaming exotica in the Peterson, fun with friends in Catalina, hikes in the heat and talk of movies while looking over the twinkling lights of LA. Then there was star watching with the Sturks and of course, big walks to big places. We shall miss the view. Our last proper day in the Rockies, so what to do? 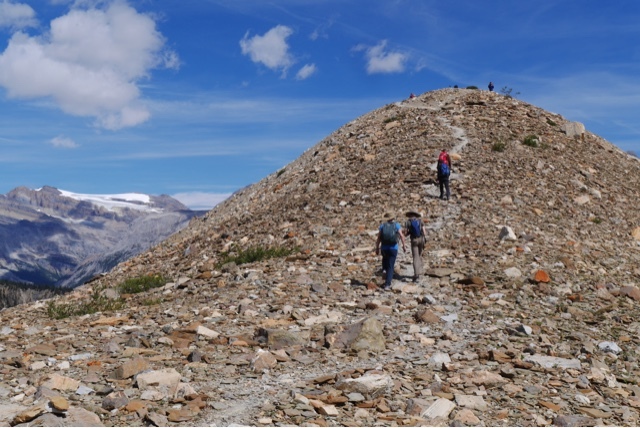 The one hike that keeps coming up when we talk with people in campsites is The Iceline. "Oh you MUST do The Iceline" and "The Iceline! 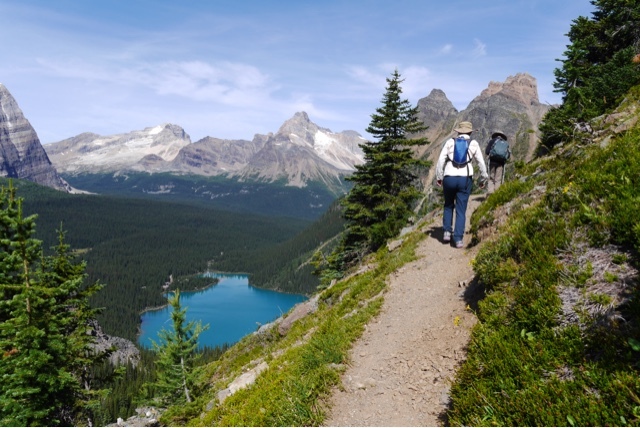 It's my favourite hike - are you going?" Yes well erm... 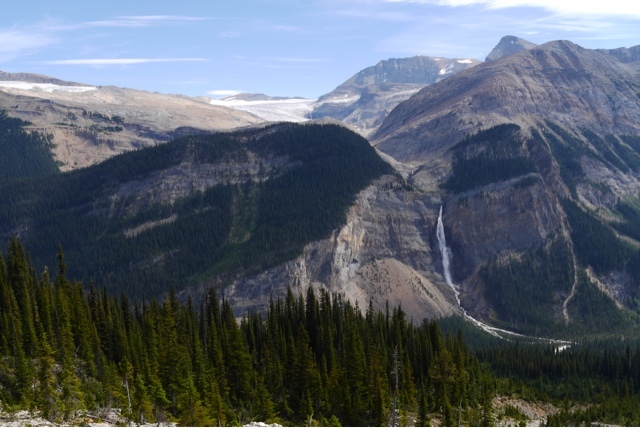 It is one of the most famous in the Rockies and starts from the tallest waterfall in Canada (see previous note) so what's not to like? Actually the only thing not to like is the fact that the long road up the mountain to the Takakkaw Falls has a couple of switchbacks too sharp for long RVs which must reverse between them. Hmmm. Tim got to this point in their RV, decided discretion was the better part of valour and turned back. Thing is, we really really want to do this hike and the only thing standing in the way of it is whether I can go through with the whole reversing up a switchback bit. So I had better man up! But I also Had A Plan. Namely, let's go really early to avoid the traffic and get a parking spot at the falls, and have breakfast there. So at 7.15 we pulled out of the campground, T still fast asleep and P joining me up front after giving up on the idea of any further snoozing. It was lovely to see the sun light up the mountains in front of us though. And when we got to the Takakkaw Falls road there was no-one on it which meant I could actually do a three point turn and avoid that whole reversing thing. That won't be possible on the way back down though... By 8 we were in the parking lot and making pancakes, joined by a somewhat befuddled Tom, who being 13, had slept through the whole drive. Suitably nourished and clothed and with plenty of water we set off, along with a large portion of the rest of the region's tourists. First past the Falls which are pretty splendid. Imagine a large river shooting over a cliff at considerable speed and you have the idea. The noise was impressive too, a constant crashing and roaring that we could hear for the first few hours of the hike. We could see the falls too as we climbed steeply up the other side of the valley, through trees that got thinner and shorter as we ascended. 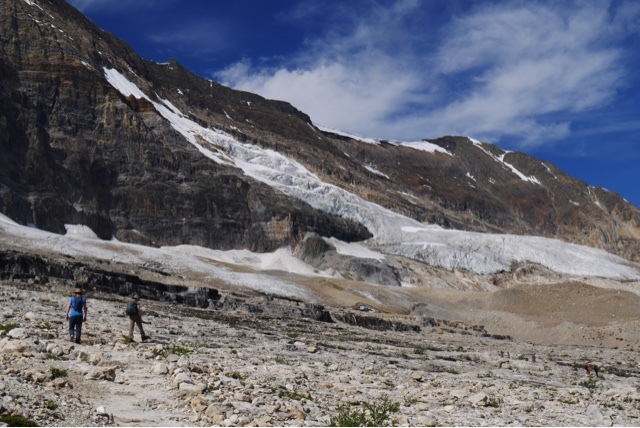 It took at least an hour to get above the tree line into rocky scree which we followed until we were walking beneath the Emerald Glacier, just a few hundred meters away, hugging the broad flank of the mountain. 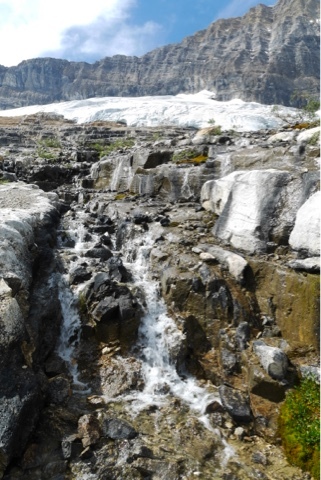 Its meltwater cascaded down through channels in the rocks so that we were again surrounded by the sound of rushing water. The sun was fierce and we were all light headed from the steep climb. I say "all" but that really means me and P. Tom, who was humming, seemed unaffected as always. The further and higher we walked the more impressive was the view. 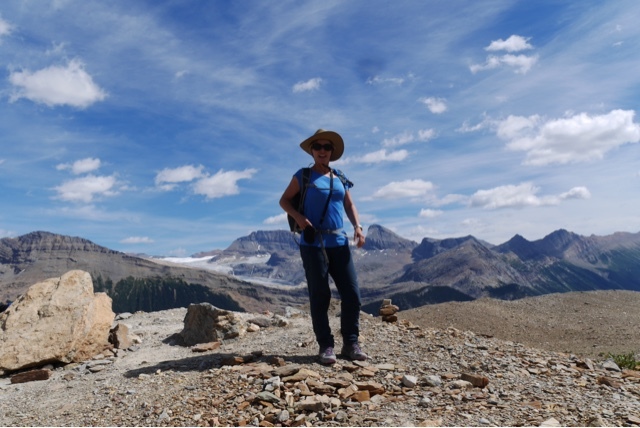 Behind us were peaks silhouetted in the distance; across the valley was the crisp frosting of the Wapta Icefield, draped over the mountain range and feeding several glaciers and the Takakkaw Falls. It was hard work but so worth it and soon we were passing small meltwater lakes and huge rocks left by the retreating glaciers. The air was utterly clear and we could see for miles. The best view on the Iceline is at its highest point at 7,340 feet, at which point we had climbed 2,400 feet. The viewpoint is on a steep, pointed hill which we climbed and found a large, flat piece of rock to sit on. This was a view and a half, stretching off in all directions while the sun shone and a sharp breeze took the edge off it. Perfect place for lunch you might say. And you would be right. The way back is essentially the way we'd come. 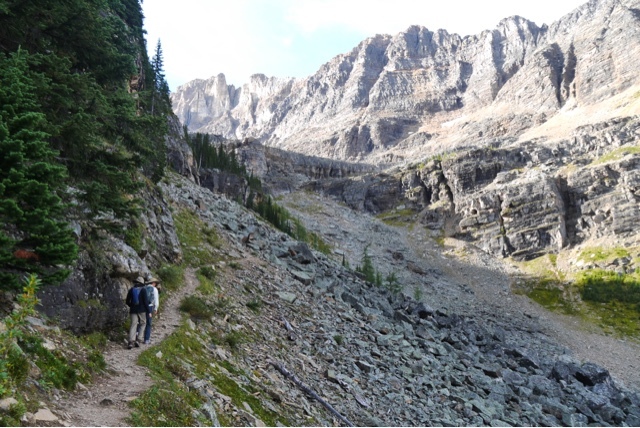 Unless that is, you take another spur down into the Yoho River valley which makes the walk a bit longer, but avoids the steep descent. Were we up for a walk of 21k? Yes, on a day like this we were. So we headed down off the rocky slope and were eventually walking into cool pine trees with trickling streams and flowers. It was a completely different environment; less drama but just as pretty in its own way. It was a long walk down through the woods, punctuated with a couple of dazzling small lakes and a terrific waterfall. Laughing Falls wasn't even in the guide book but was a glorious explosion of water through a narrow, twisting canyon, pounding the shallow river below and atomising into a fine spray. 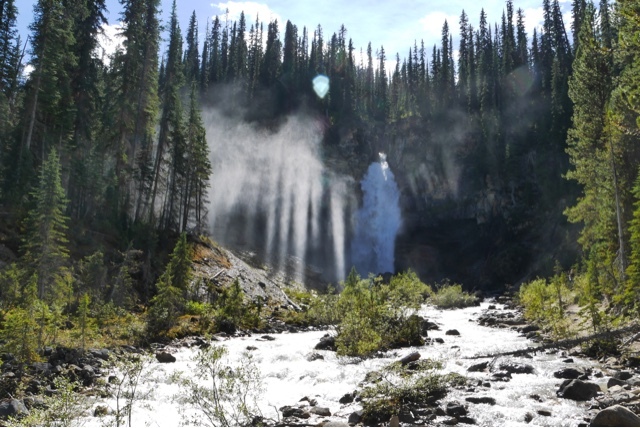 By the time we got to the Yoho River and the final four and a half K we were all bone tired. 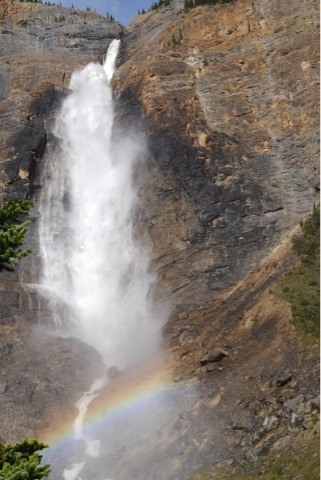 Soon though we could see spray emerging from the cliff signalling the Takakkaw Falls and journey's end. In the RV there were ice-creams in the freezer that just had to be finished up and remarkably it didn't take much more than that to perk us back up. We walked down to the base of the falls with them. You can get pretty close and we were drenched by the spray. There is nothing like a faceful of melted glacier to revitalise you after a hard day. This waterfall is an angry, violent pounding of a thing, with the thunderous main channel twisting and churning and pushing little cascades out to other parts of the cliff as if there simply isn't room for all that water down the middle. In the late afternoon sunshine a rainbow appeared and then another above it. A double rainbow to cap the end of our final day in the Rockies. It seemed appropriate. So there was only one thing to confront now. The dreaded switchbacks. I got out ahead of the traffic leaving the parking area and halfway down the road there was no escaping them. Teeth gritted, I nosed into the end of one switchback, found reverse and backed down the narrow road to the next one. It was steep, and narrow, and the motorhome is no lightweight but the upward traffic waited politely while I backed into the bottom switchback and nosed back out again. Phew! For 45 minutes we cruised downhill, past our campsite and on another 25 minutes to Golden across the border in BC. It's a sprawling lumber town, with a nice little old quarter which provided all three of the things we needed: petrol, wifi and food. After filling the RV with the first, we went to the White Mountain Bistro for the other two. It was a cool, calm and collected sort of place, with dark red walls and tall leather booths in subdued light. The menu was interesting and the service was really friendly. Yes they had wifi, so I checked us in to tomorrow's flight, and then we had salmon and steak and gourmet mac and cheese (with pork belly). Ooh it was good. We were rosy-cheeked and some of our joints were complaining a bit, but it made the food all the better. 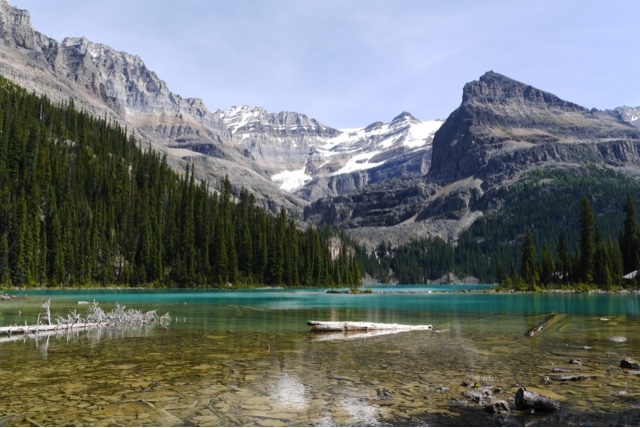 Lake O'Hara has been described as the best of the Rockies in miniature. 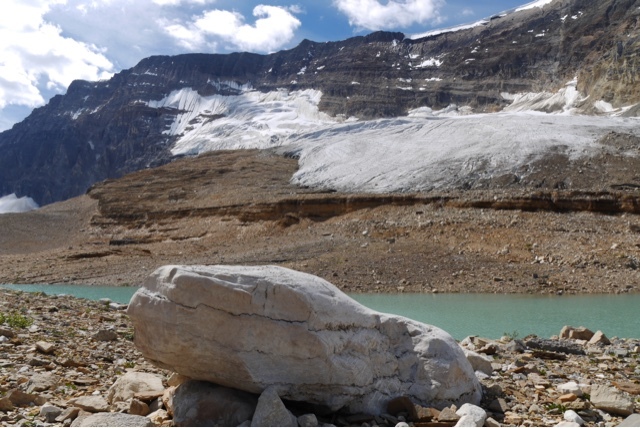 It is a little jewel of a place in the Yoho National Park and access to it is very strictly controlled. You can walk to it, but it's 12k to get there from the Highway and you can't stay overnight unless you have booked one of the handful of campsites so that's 24K without doing any hiking once you get there. 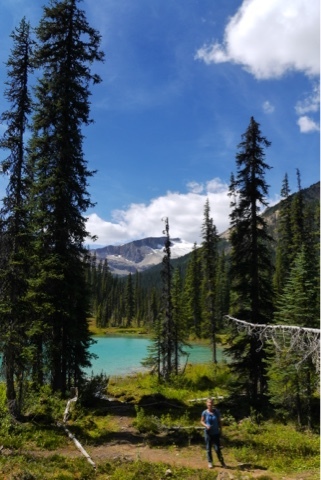 During the summer, two school buses set off on the half hour journey down the unpaved Lake O'Hara Road at 8.30 and 10.30, and they are deliberately kept partly empty. To get a ticket you have to get online at 9.00am exactly three months before the start of the season. This year, all the tickets for the entire season were sold out by 9.05. We had three of them. We spent the night in the car park overflow at the Monarch campground just ten minutes from the Lake O'Hara bus stop, but we had a bigger problem in where we would stay tonight and tomorrow - a Friday and Saturday night in peak season. 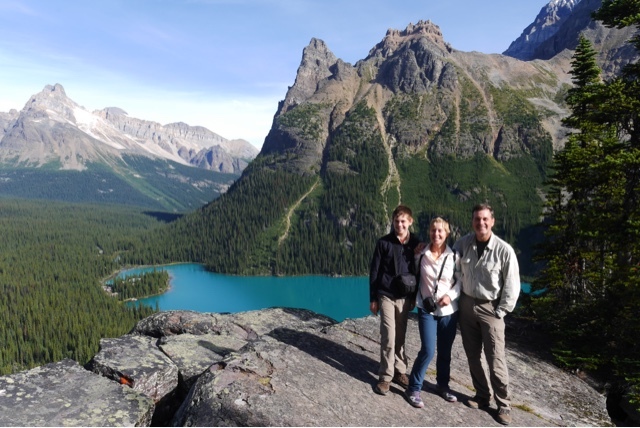 We needed to be handy for Lake O'Hara, but none of the Yoho campsites nearby take reservations. They are first come first served only. So at 7.15 we pulled up at Kicking Horse Campground check-in and hoped someone would arrive to let us get a site as people were already leaving. Even then we were third in the queue. First come first served is all very well but it doesn't half muck up your weekend if you have to be at that night's campground as soon as it opens. We had to leave by 7.55 to ensure they didn't give our tickets away and of course, no-one showed up at the campground check-in so we had to leave our place in the (now looong) queue with the question of where we would stay, still open. 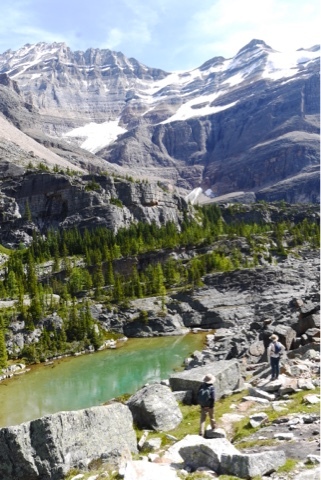 But first, Lake O'Hara. We got to the bus point at 8.10 and it was freezing. Literally. There was ice over the car windscreens in the parking area. The sun was thin in a milky blue sky and we loaded onto the yellow school bus. The first thing the ranger said when she got on board was "Congratulations! You got tickets!". There followed a slightly pious lecture about stick to the trail and don't disrupt the Pika's nest-building and don't give your candy wrapper to a Marmot, but then the bus was jostling down the track, with those of us on board feeling a bit like we had Willy Wonka's golden ticket. When the bus wheezed to a stop, it was still cold and we could see a turquoise glimpse of the lake through the trees. But we would come back to that so, bundled in fleeces we set out into the woods aiming for an alpine circuit and then a number of other linked trails. We were on our own, moving quietly through still pines on a carpet of moss. As the sun rose higher, it began to light up the mountains around us. We climbed steadily up a rocky slope, leaving the trees below us. Eventually the path levelled out on the Obapin Plateau. It's a high alpine area full of flowers and humming with bees. 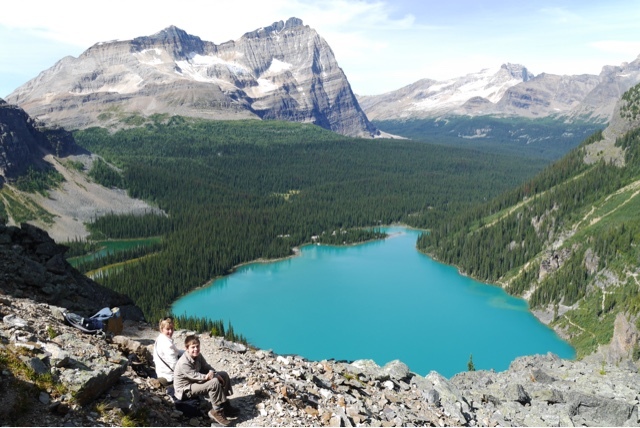 We emerged at a lookout to see Lake Mary shining green and Lake O'Hara a dazzling, impossible turquoise, with snow-flecked peaks all around. It was an absolutely stunning spot and we stayed for ages taking in the views and warming up in the sunshine. Eventually we followed the trail off the plateau and made our way over a rocky path to Obapin Lake, fed by a ridged glacier at one end. It was the perfect elevenses spot so we had the perfect elevenses. A big Marmot watched us but from a safe distance. Now we had a decision to make about where to go next. 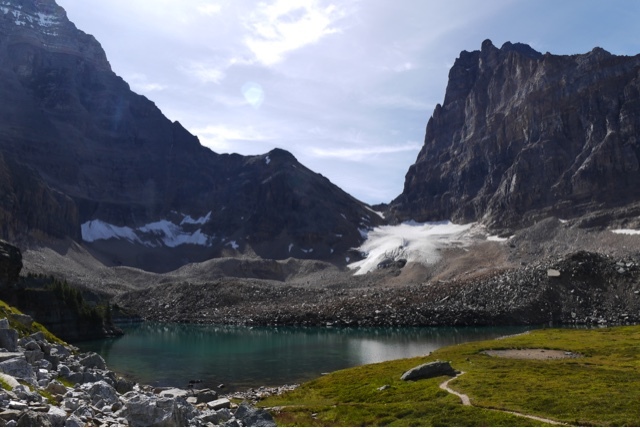 The choices were a gentle amble back down towards Lake O'Hara via another couple of lakes, or an altogether tougher route across the Yukness Ledges along the steep face of Yukness Mountain. We'd read about that route and there was some talk of "head for heights" and "experienced hikers only". Frankly though, it did look the most spectacular way to go. So we went. The track was narrow and steep and the dropoff was something that P and I tried very hard not to think about. T was entirely oblivious to it. 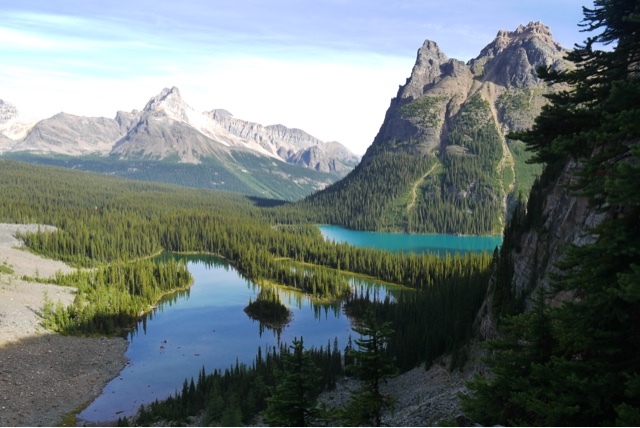 The view down to Lake O'Hara and across the Rockies was endlessly compelling and helped take our minds off the fact that a couple of steps to the left and we would be at the bottom of the mountain in very short order. The ledges went on for about ten times the distance we had imagined, but eventually we descended towards Lake Oesa and a big frothy waterfall where it spilled over into a couple of smaller lakes. 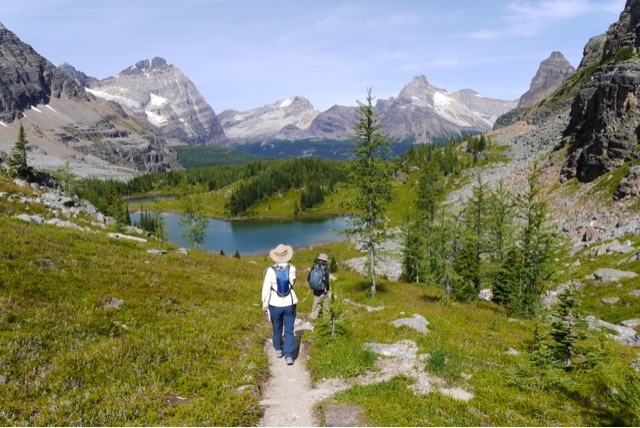 From there we were back in the alpine landscape with pines and firs all the way down to Lake O'Hara. If you have just one day in the Rockies, this is the place to try to come. It is utterly beautiful, sensitively maintained, and largely free of people. Every view is slack-jaw gorgeous and there are so many trails that you can combine all kinds of landscapes in one day. We hiked for five hours and though we were weary as we got back on the bus, we were sad to leave this pristine little world behind. Back at the RV we still had to find a place for the weekend. We shot back to Kicking Horse campground where we had once been third in the queue and pulled up at the booth. Full, since 11am. "Are there spaces still at Monarch?". "No" said the disinterested ranger, "It's full too". "Is it worth us going on the Lake Louise?". "Oh there'll be nothing for you there", she said, bored. "How about Hoodoos?" Twenty minutes back down the road. "There were 11 spaces there an hour ago" she said with a shrug. She really did not care. I guess she was bored with relaying this information to a whole stream of people. 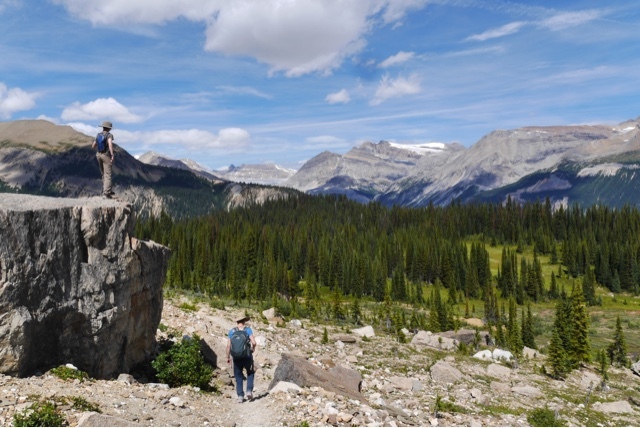 But Yoho, that's what happens when you don't allow campsite reservations. It becomes a hideous scramble for everyone. 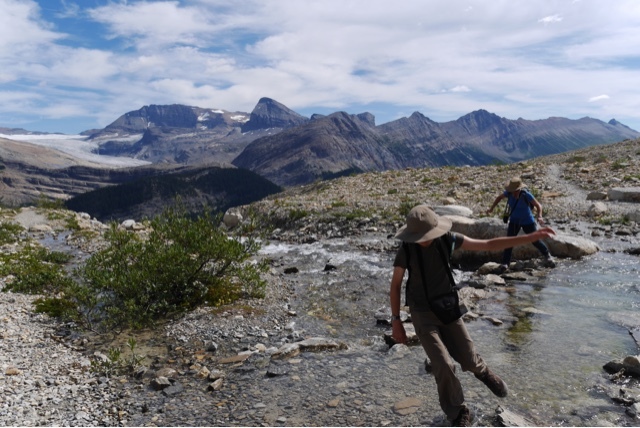 We raced down to Hoodoos and found, quite literally, the last campsite left in the entire Yoho National Park. Others were there too, frantically circling the sites and looking panicky. We got lucky. 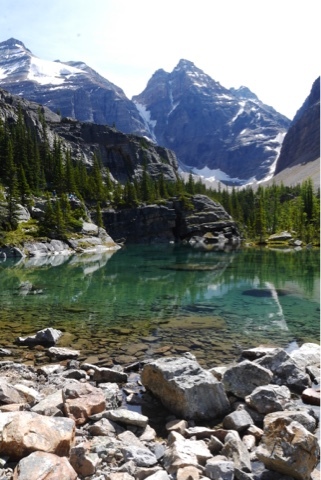 But where we really got lucky was getting to Lake O'Hara. Our Canadian campsite neighbours had never been despite many trips to the Rockies. We met another couple on the trail there who said they had tried every year for many years and never been able to get tickets. They had walked in. It is worth the effort and will be for me one of the overriding memories of this trip. Many months ago I booked three seats on the Kicking Horse River "Exciter" tour. It takes inflatable boats 12k down the river through rapids ranging from a ho hum Class II to an altogether more sprightly Class IV. More importantly, we would be on one. It's starts at 2pm sharp and would take a bit over two hours to get there. So time then for a lazy morning. Or not in fact, as the small print on the booking form said they were just over the border in Alberta, where the time is an hour ahead of BC... So in fact we had to move out in good time and sprint to Golden for a quick lunch first. There was a bookshop which had an upstairs cafe and a local lunch joint where everything was ready to go. P and T were being magnetically drawn to the bookshop with a literary glint in their eyes, but as we only had 40 minutes I dragged them into the lunch place for some nondescript food first - along with a glimpse of the Olympics on a screen on the wall. It's been going on all this time and we haven't seen any of it. Having bolted their food, P and T ran to the bookshop. It was lovely; floor to ceiling books and a winding staircase to a sweet little cafe with plenty of tables. OK yes, we should have had lunch there. All too soon though I was rounding them up again and we were off to the rafting place. As we got there the heavens opened, turning the river from a silky, sunlit, milky blue ribbon to an angry grey torrent. Oh dear. There were several boatloads of us - eight to a boat and a guide in each boat. They were a fun bunch from all over the place - teasing each other and us as they briefed us on what to do and what not to do. Then we all got kitted up - wetsuits and booties, fleeces and waterproofs - and went back up the highway to get in the river. By which time the sun was out again. In fact, once on the river it was all good fun with very little risk to life or limb. There were a couple of bigger rapids and we all got to jump out for a dunk in the five degree water. The guides kept up a constant rapport and really made the day for us. Matt, our guide, turned the inflatable upstream and we paddled like mad to "surf" the river. We got out to solemnly inspect the Class IV section, and all got very wet going down it. "Uh oh! I'm only holding on with my buttocks!" "Where am I? In the boat or the river?" "Phew! I'm balanced on the side of the boat again"
"Now I'm stuck at the bottom of the boat. I know, I'll drag Mum down here too..."
Back at base there was hot chocolate and cookies for everyone and photos for sale of all of us taken from the bank. 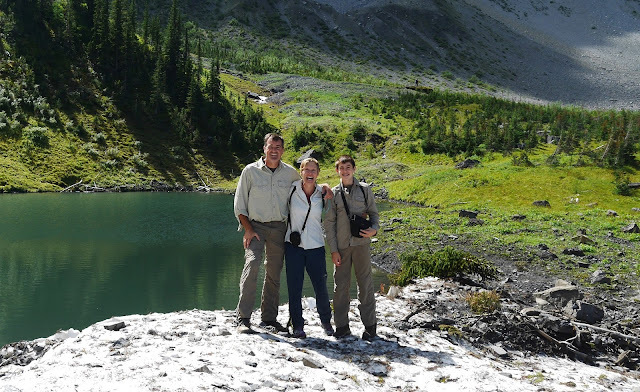 They were a great bunch and we were all smiling as we drove on into the Yoho National Park. The first stop was Bailey's Chute, the last point on the river for the Chinook Salmon who've swum all the way there from Alaska. 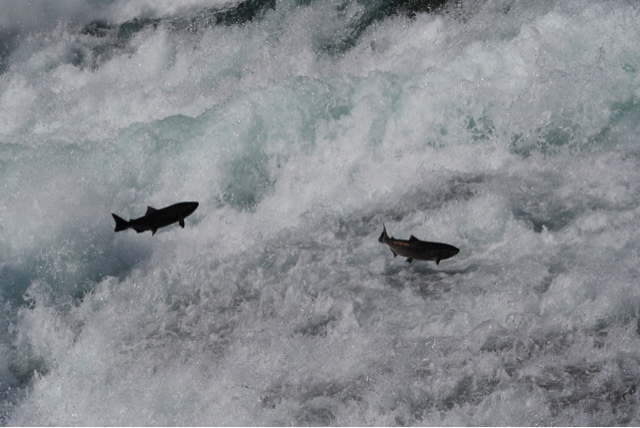 It's a steep section of rapids and at this time of year the fish try to jump them to get further up the river. But they can't. The chute is way too powerful and so, exhausted, they eventually give up and float downstream a little way to spawn. OK so here's the thing. How do thousands of generations of salmon know exactly how to swim downriver to the sea, how to pause to get acclimatised to the salt and then find the Aleutian Islands, and eventually go back to the rivermouth and back up the river, but they don't know that it is impossible for them to get up Bailey's Chute? They have all that genetic memory but that seems to be a blind spot. Perhaps when they get there they say, "Well I know no-one else has done it, but it doesn't look so hard. And the girls will be impressed..." Yes that's probably it. But whatever the reason, it made for a thrilling spectacle. 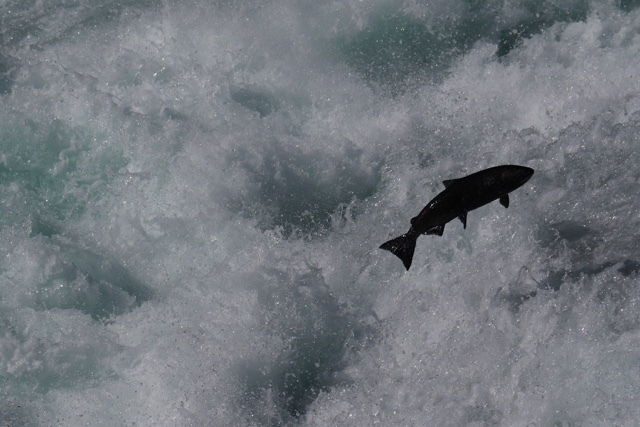 The salmon are big by the time they get here and every couple of minutes one or two will fling themselves out of the water only to be flipped and thrown back by the rapids. We were transfixed. To be honest this justified the entire trip over to BC on its own. Absolutely mesmerising. We tore ourselves away and jolted a little further down the rutted Cleawater Lake gravel road to Ray Farm, which was my pick. Philippa said "Tom, we are getting out. Dad thinks there might be some rusting agricultural equipment here". Tom's little heart skipped a beat at that as you might imagine. Sad to say there was a distinct lack of ancient Massey-Fergusons but it was a really lovely spot. 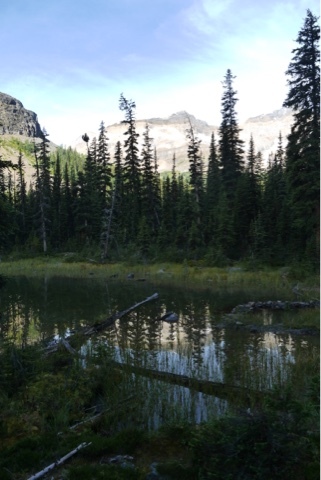 The land was given to John Ray by a local Canadian tribe in 1910 after he helped them through a measles epidemic. He and his wife Alice eventually set up a farm there and lived on the land from 1932 - 1946. They had three children there too and were apparently devoted to the place. When the children moved away from BC they gave the land to the State and it is being "returned to nature". The house is a tumble of logs. The last barn is slowly sinking into the boggy ground, surrounded by wild raspberries. John and Alice were buried on the hillside looking down over the farm. The next stop had a bit more drama. 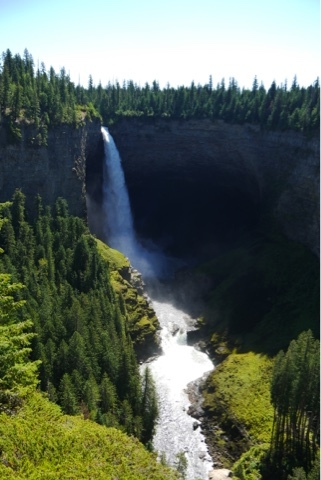 Helmcken Falls. Canada's fourth tallest! Though it has to be said these things are all about how you choose the measure them. 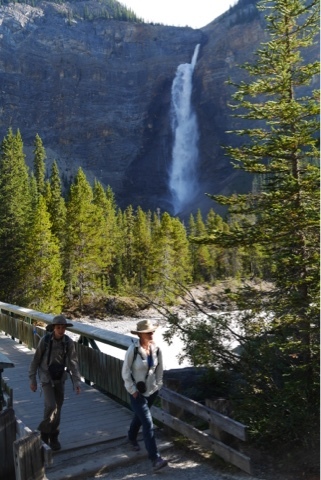 Officially, Canada's tallest falls are the Takakkaw Falls just up the road. 254 meters! 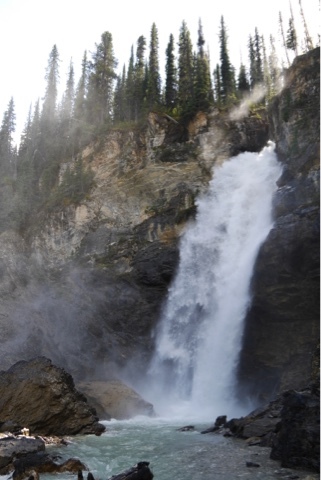 But the Della Falls on Vancouver Island are 440 meters. They though are broken by a ledge, so they don't count at all. Apparently. Anyhoo, the Helmcken Falls are named for someone who had no idea they existed and never saw them, but they are seriously impressive "plunging" (it says here) 141 meters to the canyon below. It's quite a sight and looks like a dam has burst somewhere. 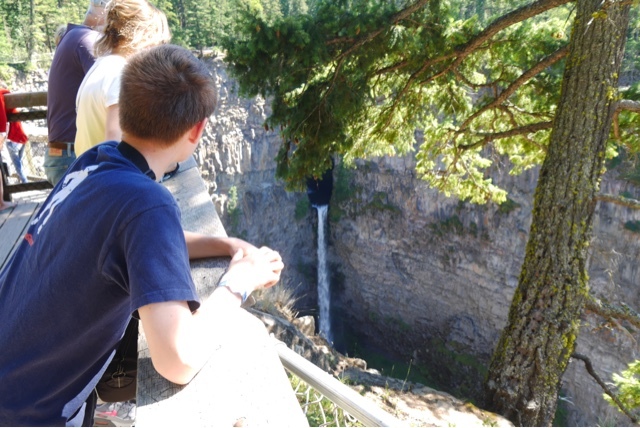 And on, finally to Spahat Falls (Wells Grey is famous for its waterfalls) which is as dramatic for the mighty canyon it has cut as for the falls themselves. You could walk along the canyon to another set of famous falls but we were out of time. We had to get back over towards the National Parks in Alberta and didn't really know where we would end up tonight. The highway goes through Kamloops but our trout chef last night said there was a short cut over the mountains involving a section of gravel road. I asked in the (very good) Clearwater info centre about it and they said it was indeed a short cut. We also used their wifi to line up a campsite near Sicamous. So now we had a plan and hit the Trans-Canada Highway for 60K before turning off onto Agate Bay Road. It was a gentle rolling drive to start with through a lush valley floor where small farms were raising cattle. 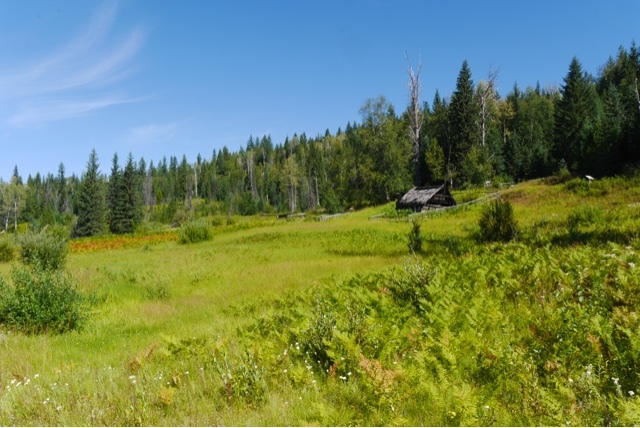 We passed the remnants of many old log cabins, slowly dissolving into the landscape. At one point we were held up behind a tractor with a trailer overloaded with hay and enjoyed the quiet of being on a backroad in the late afternoon sunshine. Eventually the road abruptly ran out, and we dropped a couple of inches onto a gravel logging track. It rose up along the flank of a mountain, looking down onto deep blue Adam Lake below, the shoreline dotted with cottages and tiny boats. The road was rough in paces but not bad and we didn't meet any thundering logging trucks. Eventually, at the fantastically named Squilax, we descended and rejoined the highway. Squilax should definitely be a thing. It's what you could do on an armchair made of marshmallow. We had definitely returned to civilisation. As we drove through Salmon Arm the roads were busy with rush hour traffic and the hotels and gas stations and resorts and roadside mini-malls all seemed to be doing brisk business. 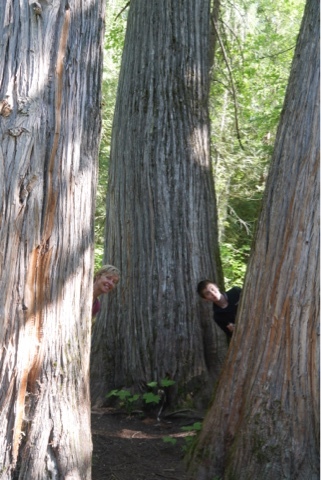 We pushed on to Sicamous and found the "Family Tree RV" campsite, which was full of willow trees. We parked by the river and watched "Local Hero" which is a friendly little film from the 80s set on the wild Scottish Coast. Freight trains serenaded us as we slept. Or tried to.